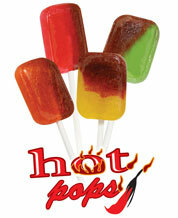 Hot Pops 640 pops in each case - $160.00 : FiveStarFundRaising!, Five Star Fundraising, Fundraising and fundaisers for all youth groups, elementary schools, and all non profit groups. Cost is$160 per master case 640 pops per master case (8 carriers of 80 pops). 24 flavors available. These are aweseome, hot but not too hot, just perfect!